A new era in the UAAP gets underway. UAAP Season 78 begins tomorrow afternoon with the customary opening ceremonies at the Smart Araneta Coliseum, followed by the UP-UE and Adamson-UST men’s basketball matchups. It will be followed by another doubleheader this Sunday at the Mall of Asia Arena, featuring the La Salle-NU and Ateneo-FEU matchups. This will be the 16th season of UAAP coverage on the ABS-CBN family of networks*, and the first in the new September-May calendar. 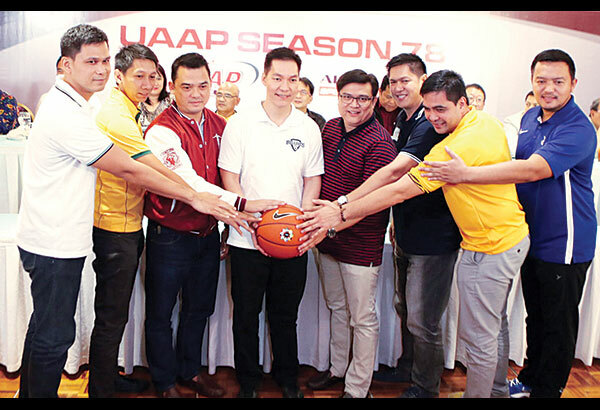 After signing another five-year deal, ABS-CBN Sports expects an even wider multi-platform coverage of UAAP events, as they continue to capitalize on its rising popularity. For more information on the participating schools, courtside reporters and announcers, visit the official ABS-CBN Sports website by clicking this link, and also visit their Facebook and Twitter accounts. (*) Games will be aired on ABS-CBN Sports+Action, Balls HD 167, Balls SD 34, iWanTV, and ABS-CBN Mobile. Finals of the men’s basketball and women’s volleyball events are expected to air on ABS-CBN Channel 2 on a weekend. When it comes to the big collegiate leagues, there is ABS-CBN S+A. IBC 13, also a good alternative w/ CESAFI and NAASCU. The exposure of the collegiate game is definitely growing. Basketball fans should take notice, baka hindi nila alam ang mga ito once the PBA Rookie Draft rolls along. ABS-CBN promises greater coverage of the UAAP this year and beyond, so let’s wait and see how will they fulfill that. I hope that they won’t forget about NCAA. Though, I have no problems with ABS-CBN prioritizing UAAP for the mean time, and with UAAP’s population is bigger. Thanks to ABS-CBN S+A, NCAA is slowly growing despite of its Arena audience. Both leagues should co-exist now that they’re with the same network. And it should not pose a problem given that ABS already provided different approaches on air to the UAAP and NCAA. So far it has paid off. We’ve seen a lot more exciting NCAA games thanks to the way ABS-CBN Sports has really done a better job covering and marketing the league. I expect the same with the UAAP with additional sportscasters coming from TV5 and a new pre-game show titled UAAP Upfront. Unlike TV5’s treatment to NCAA, NCAA’s second stint with ABS-CBN is way better. IDK kung kukuha sila ng additional sportscasters from Sports5. We should leave major collegiate sports to ABS-CBN Sports. Sila na ang Philippine version ng CBS Sports, in regards with major focus on collegiate sports, particularly sa college basketball. Indeed. We’ve been saying that for quite awhile now. Yup, I agree. NCAA has been interesting since it returned to ABS-CBN S+A. NCAA has been more of Masa approach and targeting the youths, while UAAP is focused on their alumnae. I can observe that based on how their intro video style before games were played. Anyways, hope both leagues will continue to grow under the ABS-CBN Sports banner for the years to come. And I agree that ABS-CBN is the home of college basketball. While Sports 5 should be the home of Professional and International Basketball and sports. Time to separate and distinguish both networks’ sports divisions. UAAP is now broadcasting in 16:9, letterboxed in 4:3 TV sets. It seems na HD-capable na talaga ang UAAP at NCAA telecasts sa ABS-CBN Sports + Action. We’re now in slow transition to digital, so it was a nice move. I expect that to happen to the UAAP as well. And for good measure, even Smart and PLDT were added as sponsors to the UAAP, not to mention calling the name of the Big Dome as the ‘Smart Araneta Coliseum’. Both ABS and Smart/PLDT are now in good terms with each other. MVP is now starting to realize that the marketing powers of ABS-CBN shines better than his own tv network. Especially now that PLDT/Smart and ABS are in good terms these days. That “UAAP Upfront” thing is a great move for the ABS-CBN Sports. Time to shine and give more exposure to other sporting disciplines, aside from the usual Basketball, Football and Volleyball na may big popularity. Exactly. Which reminds me of several years ago when before the 2nd game, highlights of other sports were being reported as well. And even before Upfront, there was a time when the then-Studio 23 aired a UAAP highlight show every Tuesday afternoon. I think MVP should consider to the PBA board to move the PBA games to ABS-CBN Sports especially with the confusing situation happening now at TV5. Problem is, would ABS cooperate? Especially now that college sports is their focus and PBA demanded that games should air on a VHF channel. That’s the problem, friend. Many PBA board members are old school and they believe that S+A has limited nationwide reach. Oh well. Better wait if they change their minds. For now, leave it like the American networks do.